A good friend of mine, Shawn, who is a landscaper, called a couple of weeks ago. He wanted me to go with him to look at a tree that needed work, and so I did. The tree was owned by the parents of an old friend of Shawn’s, who now lives on the west coast. Shawn’s friend had called him and asked him to get the tree work done for his parents, and told him about The Accident. 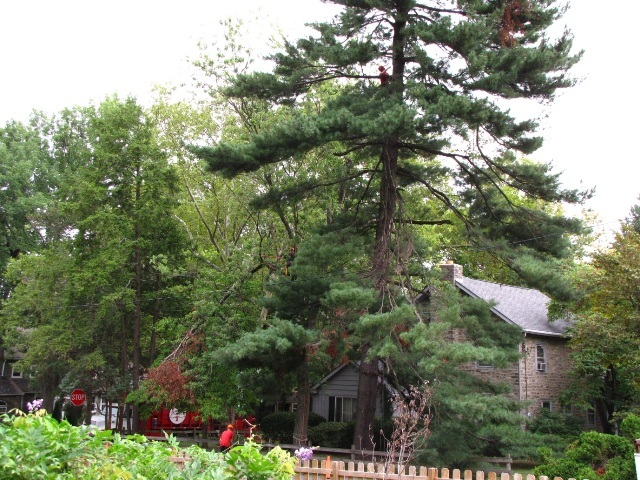 The tree, a white pine, had been damaged (like so many in our area!) by that last big snowstorm last winter. Several broken branches were still hung up in the tree where, if they were dislodged, they might land in the street and hurt someone. That, I guess, was probably why Shawn’s friend’s sister wanted to help. Visiting her parents and seeing that they appeared to be in no hurry to take care of the tree, she decided to do it herself. She climbed the tree and a branch broke and she fell to the ground. Her mother told me they all feel fortunate she will walk again, but she is still recovering from a broken back, broken neck, and broken ribs. After the incident, I think everybody in the family was anxious to get the job done, and done by a professional. We did the job for them today. It cost $312.00. So, is tree work dangerous? My answer has always been NO, or at least there is no reason it needs to be. Often when we’re pruning or removing a big tall tree a client will comment that the work looks dangerous, or “isn’t that climber scared?” My stock answer is “the scariest thing we did today was the drive to your house.” We had to share the road with all those distracted or impatient or angry people who are late for work. Once we’re on the job, we’re in control of the situation. Everybody knows all the safety procedures, we work as a team, we have good modern personal protective and fall safety equipment and know how to use it. Nobody does work they are not trained for and skilled at. The chances of getting seriously hurt are pretty small until the ride home! But we don’t take safety for granted. We are always learning from organized training programs. Everyone attends formal training in first aid, aerial rescue and electrical hazards. We go to seminars where we learn from others’ mistakes – accidents and near misses. We analyze the potential hazards on all our job sites. Years ago an insurance agent gave me his opinion why workers comp rates were so high for the tree industry. He said something like “you guys and painters- it’s not that your work’s so dangerous. Just that you seem to hire an awfully lot of alcoholics and druggies.” I can’t say there aren’t still some marginal characters lurking in a few companies disgracing the lower echelon of tree “services”, but the stereotype definitely does not accurately portray the whole tree care industry! Our trade organization- TCIA- Tree Care Industry Association- continually works to improve safety in our workplace. 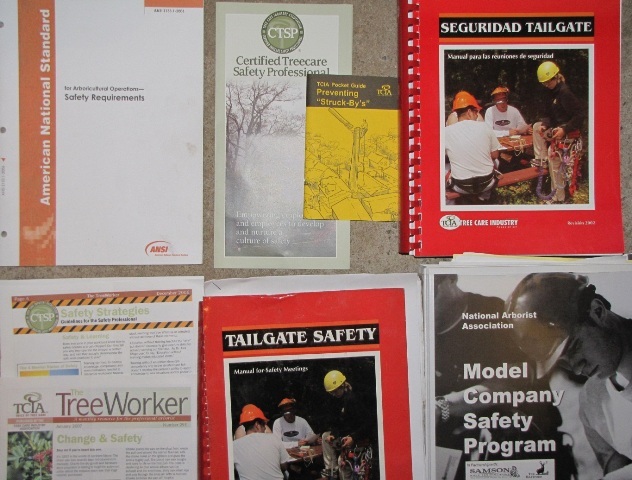 They publish lots of safety training programs and co-sponsor the ANSI Z133 safety standards for tree care. 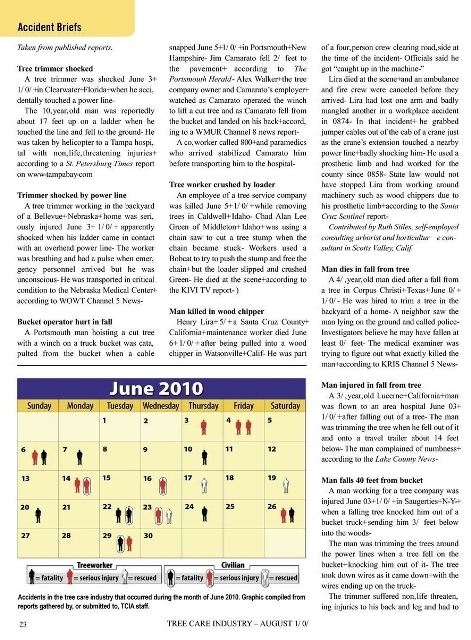 Each month as I read between the lines of these tragic stories, my opinion is reinforced that serious accidents among trained and skilled arborists are relatively rare. A disproportionate percentage of these stories imply some indication that the victims were unqualified to be doing the work that hurt them. So many casualties seem to involve fly-by-night type companies or individuals, landscapers and others doing work beyond their qualifications, and do-it yourselfers. IT DOESN’T HAVE TO BE THIS WAY!